Math games can make learning important concepts you need to teach fun for students to learn! Let them practice with these fun and engaging math game that will make the skills something students WANT to do! Works great for math centers | stations, early finishers, or small group. 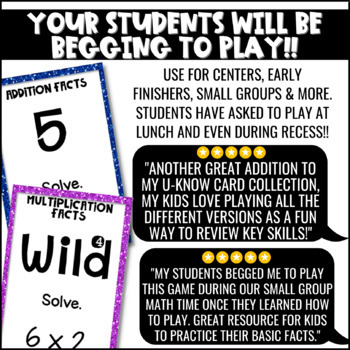 Students will be begging to practice math topics with these games! I’ve had many students ask to play at recess and even lunch! Math games are a fun way to get students practicing! This product is a bundle of 4 sets of Math U-Know Cards found in my store! You only pay for 3 minus the bundle discount since one is already a freebie. 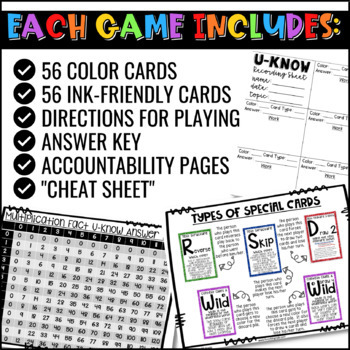 U-Know is a fun and engaging card game where students practice topics in a repetitive way. I also use U-Know in stations or for early finishers throughout the year to spiral concepts for students. U-Know comes in MANY topics! So, once students learn the game, it will become a self-run station! U-Know is played with students matching color/number to the card the previous player put down. Once they put their card down, they must read and answer. If correct, play moves on. If incorrect, player draws 2 new cards and play moves on. Students check answers with the included answer key. If you like this game, be sure to check out my whole line of U-KNOW Games!!! ✔ My other U-KNOW games! ✔ My other Math resources!